The explosion of bookstores, publishing houses, libraries and literature courses was an important component of San Francisco's struggle for identity and community. In the years between Stonewall and the AIDS epidemic, lesbians and gay men separately and together charted new territory, established a tradition and literally changed and saved lives. Gay studies pioneer Jack Collins and groundbreaking feminist publisher and bookseller Carol Seajay speak candidly with historian/librarian James Van Buskirk. 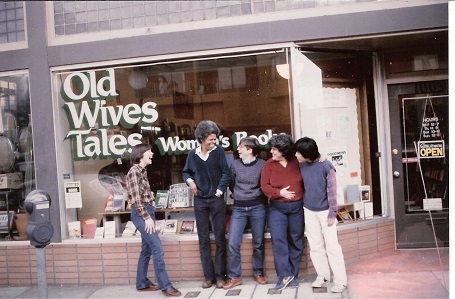 Image credit: Old Wives Tales Collective: Carol Seajay, Pell, Sherry Thomas, Tiana Aruda, Kit Quan. Photo: JEB/Joan Biren. Banner image credit: The Feminary Collective 1984. Oldest running/continuous lesbian feminist publication. 20th and DeHaro in Potrero Hill. These women were the editors and publishers. (l to r) Sim; donor; Jean; Tiana (on top) at Jean's house. by Sherry. SAN FRANCISCO HISTORY CENTER, SAN FRANCISCO PUBLIC LIBRARY.